Lanham, Maryland — Across the United States, about four out of every five homes have asphalt shingle roofs. Annually, as those roofs are replaced and maintained, about 12 tons of waste shingles are generated, and another 1.2 million tons of manufacturing waste shingles are generated during the production of new shingles. However, this asphalt-rich material does not have to end up in landfills. The asphalt binder, aggregates, and fibers in waste shingles can be successfully put to use in new roads, parking lots, and other asphalt pavements. In fact, in 2017 asphalt mix producers used nearly a million tons of waste shingles in new asphalt pavements. 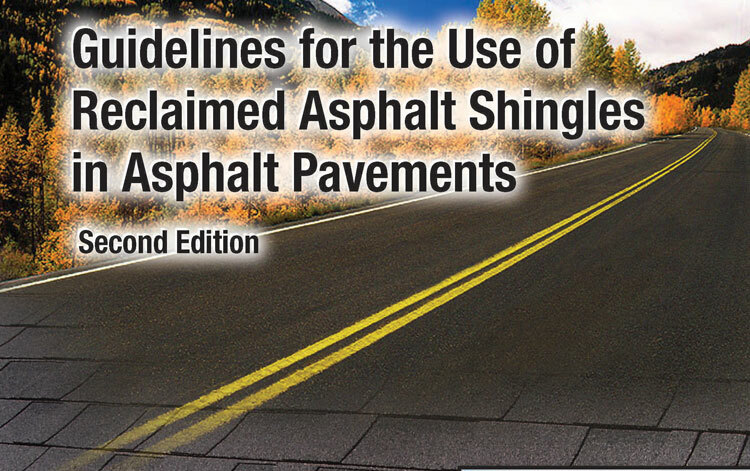 To aid in the further use of waste asphalt shingles in asphalt pavements, the National Asphalt Pavement Association (NAPA) released an updated version of Guidelines for the Use of Reclaimed Asphalt Shingles in Asphalt Pavements (Information Series Publication 136), updating guidelines originally issued in 2009. Guidelines for the Use of Reclaimed Asphalt Shingles in Asphalt Pavements, Second Edition (IS 136), compliments the previously published Best Practices for RAP and RAS Management (QIP 129). Both books are available as PDF downloads through the NAPA Online Store, http://store.asphaltpavement.org.